In 1283, Zen master Dogen, founder of the Soto Zen School in Japan, wrote a cookbook in which he encouraged readers to cultivate mindfulness through simple kitchen chores like washing rice and kneading dough. How to Cook Your Life is a documentary film filmed at the Scheibbs Buddhist center in Austria and the San Francisco Zen Center which follows cooking classes by Zen teacher Edward Brown. 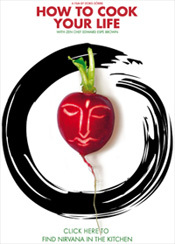 Entertaining, practical, and full of humor, Brown applies Dogen’s ancient Buddhist principles to modern day cooking, life and thought. Check out the preview. How to Cook Your Life opens on Friday, October 26 at the Lankmark Theatre at Embarcadero Center in San Francisco, the Smith Rafael Film Center in San Rafael, and other theaters across the country shortly thereafter. This entry was written by Brian McNitt, posted on at 11:20 am, filed under Life, Silliness. Bookmark the permalink. Follow any comments here with the RSS feed for this post. Post a comment or leave a trackback: Trackback URL.